Survival blankets originally designed to treat troops are now being used for new born babies making an emergency dash to hospital. Delivery Company Delsol has acquired the contract to distribute the baby wraps, manufactured by Bethesda based Blizzard Survival, for ambulance crews across Wales and in London. The Blizzard Baby Wraps are used by paramedics, community midwives and air ambulance teams to care for babies born prematurely or who are an emergency delivery. The tiny wrap, which weigh just 55 gms, expands into a 65 cm long pouch that helps to ensure the baby’s temperature is regulated until they can reach specialist neonatal care at hospital. The baby wraps were developed by Blizzard Survival in conjunction with the London Ambulance Service, and now the majority of Ambulance Service crews have begun to carry them, together with helicopter search and rescue crews. 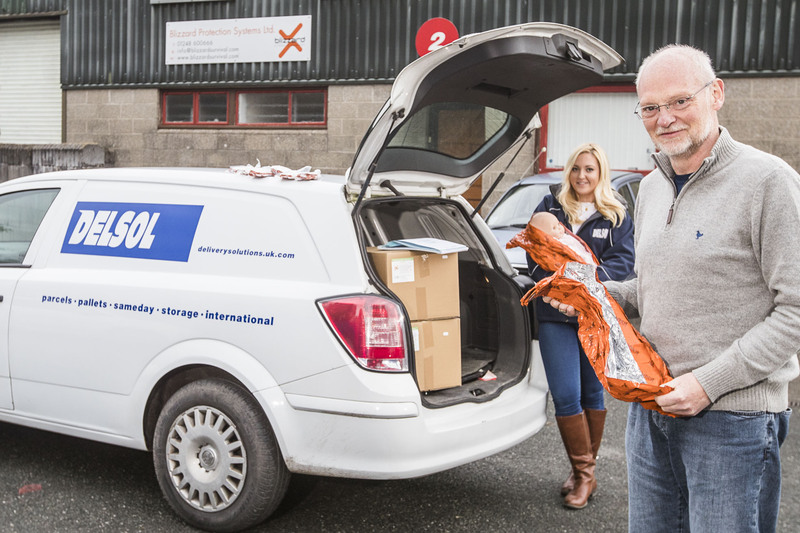 Caernarfon based parcels and pallets specialist Delsol transports the baby wraps to Blizzard’s wholesale suppliers, for distribution out to ambulance depots around the country. The company was chosen by Blizzard for the deliveries thanks to its track record of rapid delivery and excellent customer service. The wrap is based on Blizzard’s award-winning survival blanket, used by (troops in war-zones and peace-time training, along with) mountain rescue teams, fire and police crews for emergencies, plus outdoor pursuits and water sports fans. Blizzard Survival General Manager, Simon Carter, stated that more than 17,000 of the vacuum packed baby wraps have been used already around the UK by the Welsh Ambulance Service, London Ambulance and Bristow Search and Rescue Helicopters, to name but a few. “We always hope that the Blizzard Baby Wrap products will never be needed – but unfortunately babies aren’t always born on their due date when mum is safely in hospital or with a midwife at home.” For this reason Blizzard Baby Wraps are also carried by paramedics. Delsol uses its partner delivery networks both in the UK and Internationally to ensure that Blizzard Survival products reach their customers rapidly, said Joint Managing Director, Tony Parry. “Our network of distribution hubs ensures that the parcels we collect from our clients reach their customers extremely quickly. Engineer and mountaineer Derek Ryden founded Blizzard Survival, and has spent 15 years developing the company’s Reflexcell material, which provides unprecedented thermal performance in the most demanding of conditions. The Refelxcell reflective surfaces block radiated heat whilst the elastic ensures the material hugs the body, stopping drafts, reducing convection and keeping the material right next to the patient where it is needed. The outer layer is completely waterproof and windproof and so, unlike most other insulating materials, Reflexcell works just as efficiently when wet. Delsol was originally founded in Bethesda in 1999 by Tony Parry and Simon Walker. They opened a purpose built delivery depot and warehouse facility in nearby Caernarfon in 2003, and six years later launched a second depot in Sandycroft, Deeside, Flintshire. More details about the company can be found at www.deliverysolutions.uk.com, or by calling them on 01248 679933 or 01244 525090.